Bullet points. They’re everyone’s favorite way to break up lots of content. And it’s no wonder, since bulleted lists frequently highlight important information. 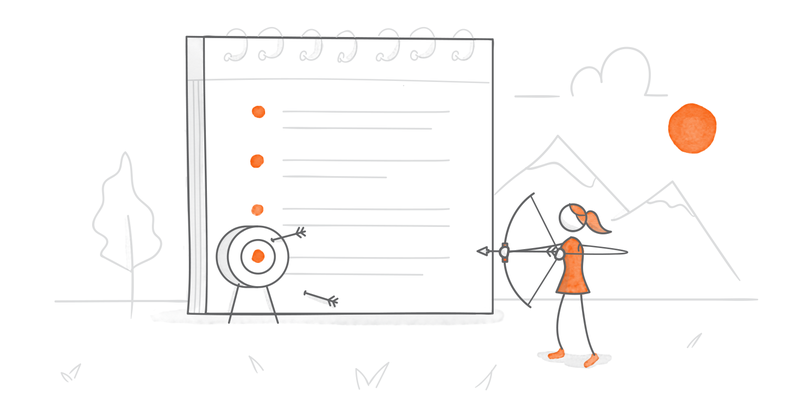 Effective e-learning is all about grabbing learners’ attention and getting them to think, which makes it pretty clear that bullets are less than optimal. So what are some other options? Below are five simple ideas. One of the easiest ways to move beyond bullets is to swap them out for something more visually stimulating and easier to absorb, like in the before-and-after slide below. Before, the entire tone of this slide is lackluster and pedantic, and some of the bullets are redundant. In the “after” slide, on the right, duplicate bullets are collapsed, tips are grouped around a relevant image, and we’ve got a snappy headline that’s a little more action-oriented. This strategy of focusing on images is a popular choice for presentation designers because it minimizes onscreen text while focusing on the key messages that are most important to the audience. Relying on images to do the heavy lifting isn’t just for presentations! It works equally well for e-learning courses. In fact, there are tons of great ideas and examples of this on display in this popular weekly e-learning challenge—including this beautiful, interactive E-Learning Primer Infographic by Stratbeans C.
Continuing with the theme of showing instead of telling, clickable images are another great way to reimagine a bulleted list. Let’s say you’re working on a medical course on organ systems. 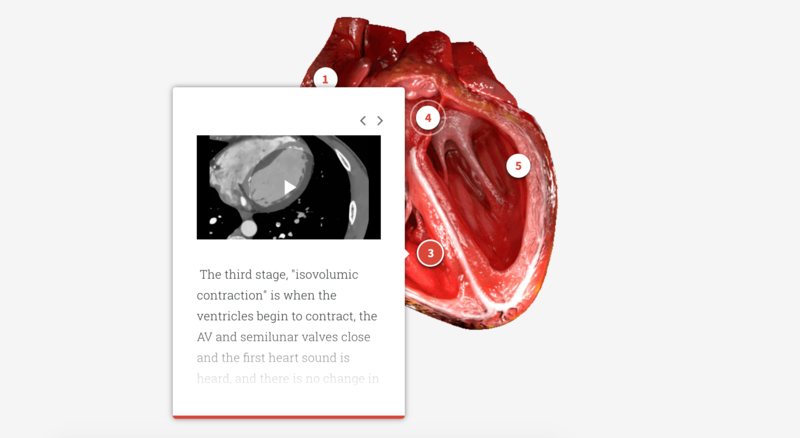 Instead of a bunch of bulleted text next to a picture of a human heart, wouldn’t it be much more engaging to let learners explore an animated beating heart, complete with text and video highlighting the features and functions of each part of the organ? See for yourself with this super-cool example from Richard Hill, built using Rise. By adding simple markers to an animated gif of a beating human heart, learners are given a compelling visual that invites them to explore and learn more about that part of the organ. That’s far more interesting and meaningful than a droning list of bullet points! Similar to using a clickable image, adding hotspots to video is a great way to turn passive bullets into a more active, engaging experience for learners. Take the following example from Steve Flowers. 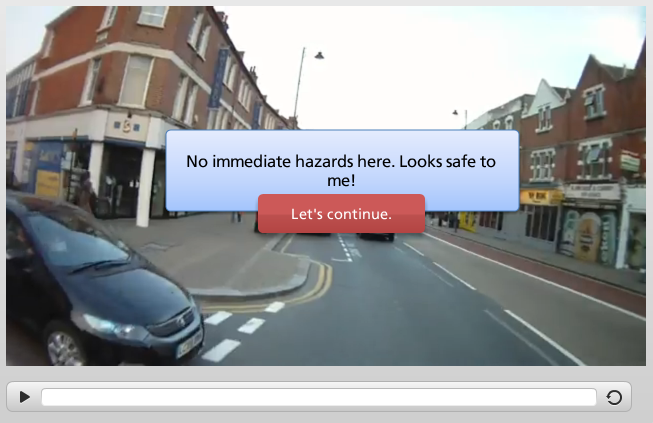 Instead of presenting learners with a static slide full of road safety dos and don’ts, he created this heart-racing experience that drops learners right into a situation, letting them spot hazards and giving them feedback on their choices. Think video is an expensive or time-consuming alternative to bullets? As Mike Enders points out in this article and video tutorial, How to Create Interactive Video, using video doesn’t require a lot of pricey equipment nor fancy editing software these days. You can easily shoot video with the camera on your smartphone and edit it just as quickly using free or low-cost apps. Even better: tools like Articulate Storyline 360 come with their own built-in video editors, which make it easy to trim and tweak your video. 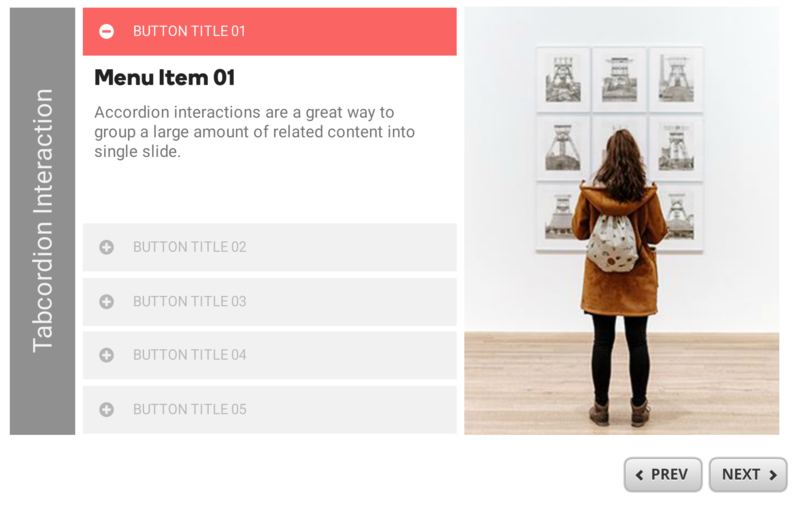 Probably one of the easiest ways to reimagine bullet points is as a tabbed interaction, like this brilliant Storyline 360 download from Montse Anderson. Creating a tabs interaction from a bulleted list is really simple. Start by morphing your bullets into steps or topics, with each key idea getting its own tab where you can expand on the idea in more detail. Not only does this approach help you chunk lots of related information, it also invites learners to explore information at their own pace. An added bonus of tabs interactions: you’ve got a flexible layout that works equally well for creating menus and submenus, too! For an easy way to get started with tabbed interactions, snag this free Simple Tabs Template by Nicole Legault. If you’re ready to take your tabs to the next level, don’t miss this inspiring and cool (pun intended) Titanic Tabs interaction by Sally Cox. Want to see how easy it is build your own tabs interaction from scratch? Check out David Anderson’s 5 Minutes to Fantastic tutorial. I love how this project drops you right into a realistic customer service scenario and then gives you feedback based on your choices. This feedback is delivered both through onscreen text and through the expressions of the Content Library characters. Swapping boring bullets for enticing interactions doesn’t necessarily take a lot of time—just a little creativity. I hope some of the examples I’ve shared here are sparking your imagination and inspiring you to think of new ways of presenting information. What’s your favorite alternative to a bulleted list? Have an inspiring e-learning example to share? We’d love to see it! Leave me a comment below, or feel free to post a link in our Build Better Courses forum. Some good ideas. The more visual the better. At the same time, "interaction" for its own sake can be confusing and frustrating for the learner. 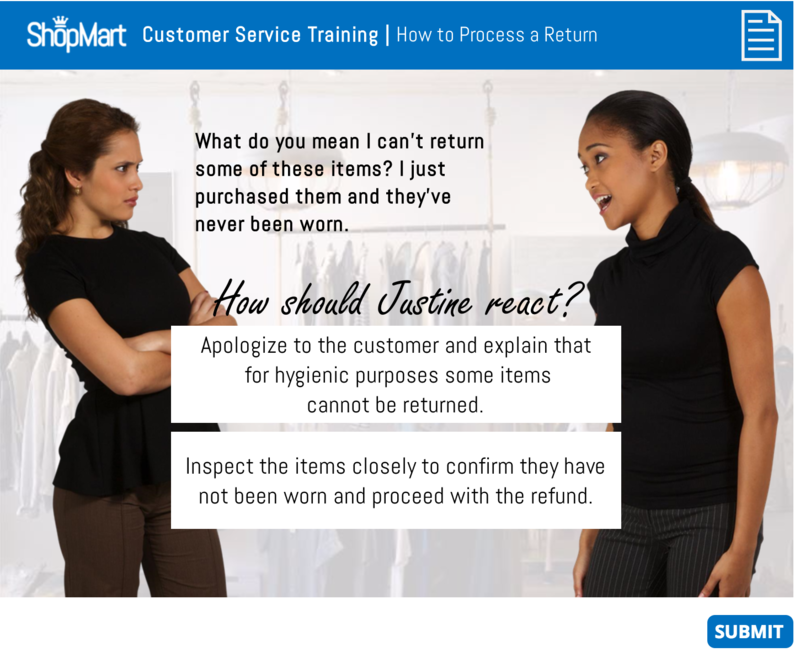 A "click each item to learn more" instruction can cause a learner to wonder if this is all discretionary? Do I have to click them all? When do i click Next again? What happens if I click out of order? Brain cells used figuring out the interface are not available for learning. Although a developer may find "click next" boring, a learner often finds it reassuring, predictable, and a stress-free means of concentrating on what needs to be leaned rather than having to figure out a different interface on every slide. Great ideas and very relevant to my current project! Thanks for the examples! For software training, I replaced numbered lists with screenshots and clickable markers that reveal layers with results screenshots. Takes the learner right through a procedure. Great article. Thanks for the idea options. I can see several that could be of use. Great ideas for turning boring into brilliant! Thank you! This is fabulous information and just what I needed to begin converting ppts into interactive learning tools. So glad this post has inspired you, Donna! Thanks for reading and taking the time to comment. Great Article. I try to do this, but the SME doesn't always want me to do this. How boring. Great article. I will definitely be using the tabbed interaction. I was also really like the image and the interaction created with it. Thank you for taking time to compile the information. I find it useful. Glad you've found it helpful, Caesar. Thanks, Paul! And thanks for sharing your work so generously with the community. That freebie looks amazing!